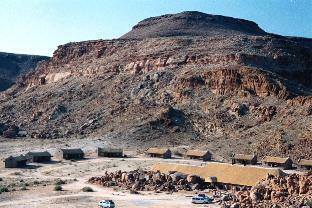 Canyon Lodge is situated just 20 kilometres from the main view point of the Fish River Canyon and next to the main road. 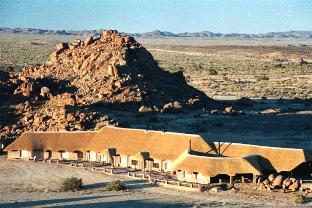 The lodge consists of 26 bungalows built out of natural rock, thatch roofs and full en-suite facilities. 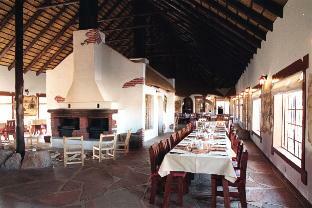 A restored farm house, built in 1908, serves as the lodge restaurant. 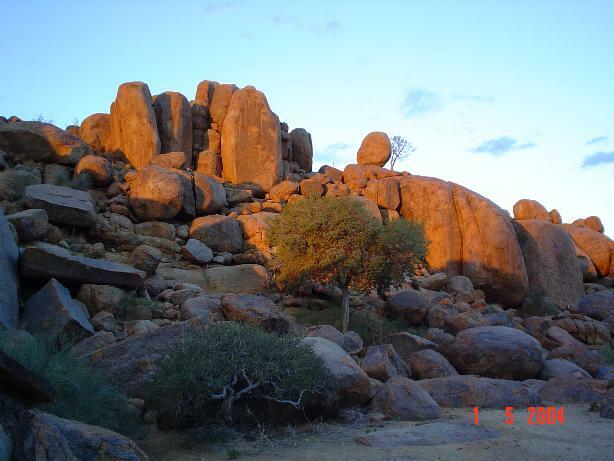 The nearby Quiver trees and impressive rock formations cater for the hiking enthusiasts. Canyon Road House offers 8 en-suite rooms, a la carte restaurant, fully licensed bar, private camping sites, a swimming pool, fuel station and information centre. 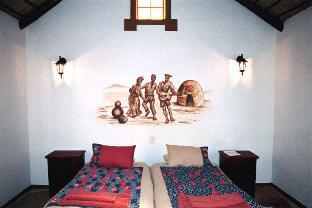 Canyon Village is a new Cape Dutch cottage style lodging situated just 20 km in close proximity to the Fish River Canyon, making it the closest to the viewpoint and also it is 1 ½ km from the main road. The Village is sited in mountainous surroundings to take best advantage of the beautiful view offered by the Gondwana Canyon Park. 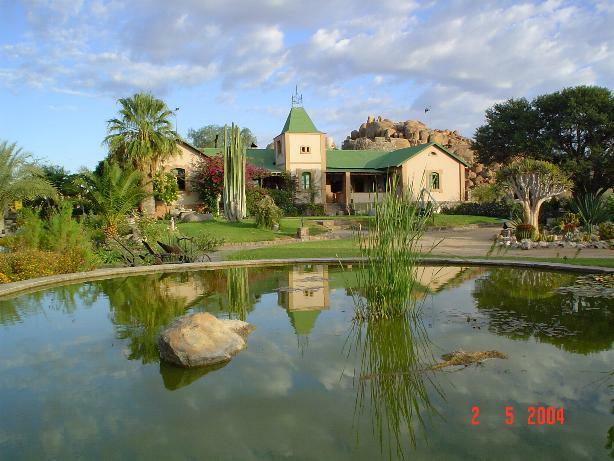 It affords close access to the Fish River Canyon and offer privacy and exclusivity. 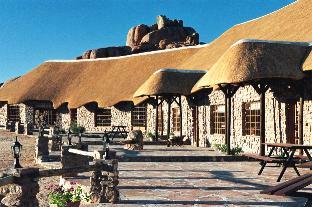 There are 24 superbly appointed rooms with a total of 60 beds each with en-suite facilities, integrated with in granite boulders, thatch roof and a spectacular view both on the east and to the west. There is a fully equipped restaurant with a magnificent view, a stunning swimming pool also integrated with in granite boulders giving it a superb view of the rocks. 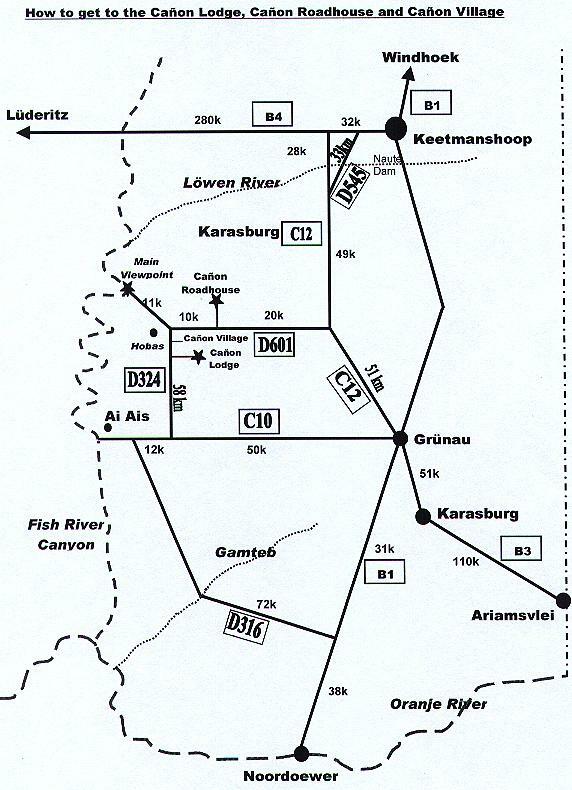 The idea of founding the Gondwana Canyon Park was born in 1996 when a small group of dedicated Namibians decided to try to preserve a small area bordering the eastern side of the Fish River Canyon National Park in Namibia's south. For decades, this land has been used for sheep farming which in the end proved unsustainable in this semi-desert area that receives less than 100 mm rainfall annually. What started out as a small idealistic concept has grown today into a full-scale park of approximately 100.000 ha. Even in this short period of time a substantial recovery of the flora and fauna has taken place. A lot of effort has been put in removing all the existing fences and establishing waterholes for the game. The regular game counts prove that we already have a healthy, albeit small population of kudu, Oryx, springbok, ostrich, mountain zebra and a variety of smaller antelopes. Even leopards are sighted regularly again. A new ranger team has been formed and the plans for the direct future include purchasing more game to enlarge the numbers as well as to reintroduce species that are endemic to the area but currently not present. A substantial amount of the funding of the Gondwana Canyon Park comes from the bed levy of 5% that is being transferred from the proceeds of both the Canyon Lodge and the Canyon Roadhouse into the Gondwana Canyon Park Fund. Thus by staying at the Canyon Lodge each guest actively contributes to the motto: "Give back to nature what belongs to nature". 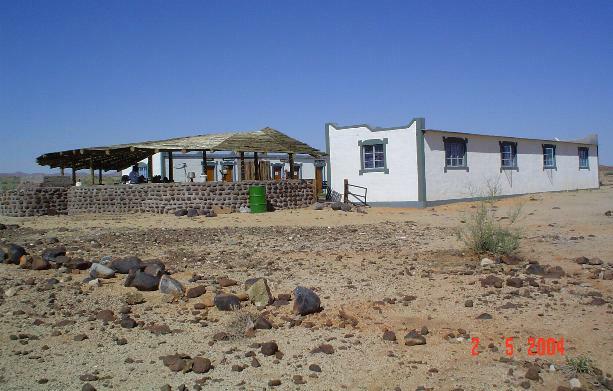 Just 6 km from the Canyon Lodge, and situated amongst beautiful dolerite hills, this mountain Camp offers a self catering unit with 8 double rooms, with ready made beds, communal showers and toilets, fully equipped kitchen and dining room and an outside lapa and barbeque area. All guests staying at the Canon Mountain Camp can make use of the restaurant at the Canyon Lodge as well as participate in any of the activities offered, such as horse riding, sundowner drives and Canyon flights. 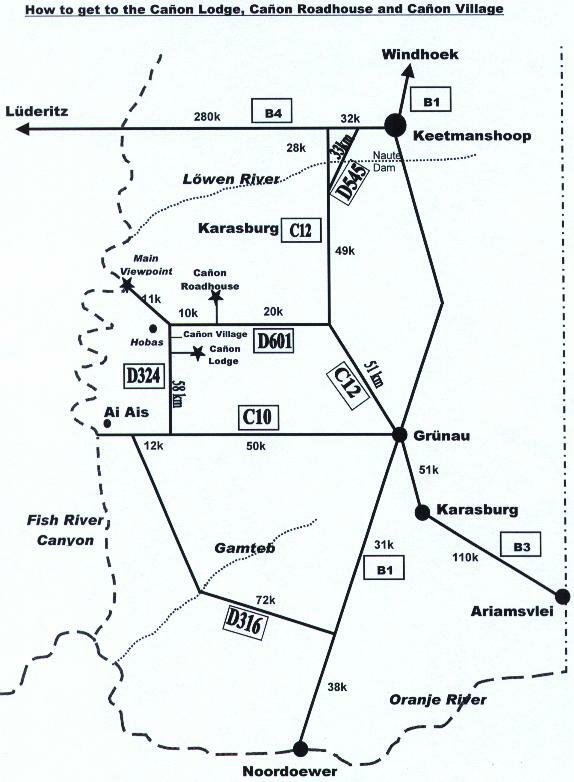 Take the main road B1 going south for about 500 km, turning right into the road B4 to Luderitz. Turn left into C12 road at Seeheim and after about 70 km right into road 601. The Road House is located further 20 km on. Canyon lodge is located further on turning left on the road 324 to Ai-Ais. Member of Hospitality Association of Namibia. Canyon Village: 24 rooms with 60 beds. 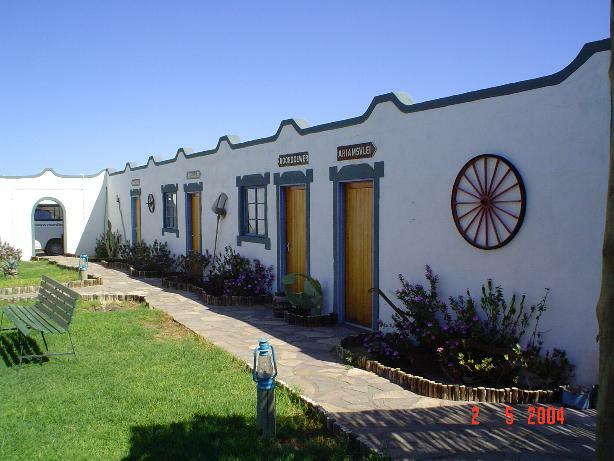 Canyon Road House: 8 rooms with 20 beds. 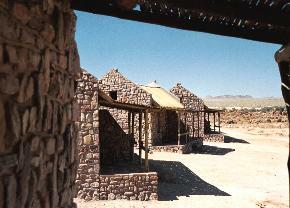 Canyon Mountain Camp: 8 rooms with 16 beds. 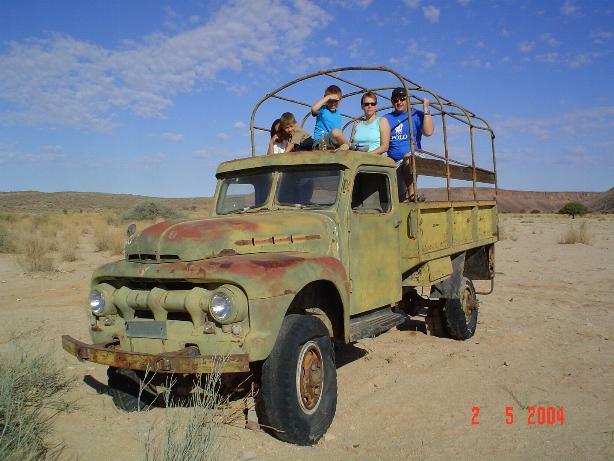 Transfer to main view point and back to the lodge, transfer to Ai-Ais and back to the lodge, transfer to/from Keetmanshoop (railway station), transfer from Hobas airstrip via Canyon view point, horse riding, sundowner drive. Rates are subject to change without prior notice should tax be increased or Government levies introduced. Rates include Value Added Tax and breakfast.